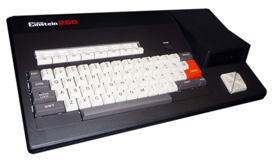 The Einstein 256 (TCS-256) followed on from the TC01 and was very similar to the original, but with more memory, improved video and a slimmer black case. Whilst the Einstein may have been technically impressive (and loved by programmers), its price (£499 for the TC01) and specification fell in the uncomfortable mid ground between home and business computers. Although Tatung themselves wrote software for the machine and produced a dedicated user magazine, unfortunately, few third party software houses were interested in developing for it as its price was too much for the home computer market. Ironically, it was so popular with programmers that it was used by many software houses for programming, then porting the code to other more popular games computers such as the Spectrum, Amstrad and Commodore 64! Equally unfortunate was that despite the standard ports, disk drives, RGB output and great keyboard, it lacked the power (and software support) for the growing business and education markets. The excellent machine was stuck between a rock and a hard place.